Raced in California as a 2- and 3-year-old, with 4 wins, 2 2nds, and 2 3rds out of 11 starts, and earnings of over $12,000. Previous foals, since she’s been with us, are Doc (2002), Cash (2003), and Dollar (2004). 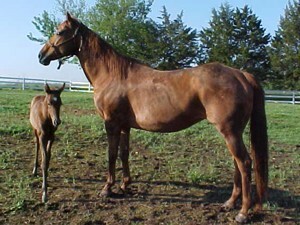 Now in foal to Roll the Cash, a black son of Dash for Cash, for a February, 2006, foal. Perky is the prettiest sorrel color we’ve ever seen. She shines like an uncirculated penny! She is tall and long, and so are her babies. Even at age 15, she is still very fast. When the herd arrives at the barn “en masse,” she usually comes in second, right behind her son, Doc. She has had some problems with one foot since we’ve had her, but with good care and the right diet, it is much better, and does not prevent her from being a great broodmare.